If you’re looking for sentence building games, worksheets, and activities, we’ve got you covered! My daughter started grade 2 in the fall, and while I often have to pry information out of her in the afternoons – LOL – I have been amazed to hear about all of the cool things she’s been learning. She attends a quaint little Montessori school that has totally captured my heart, and I love that she is able to focus on the things she enjoys while still being challenged to dive into new material. One of her most favorite school activities is writing in her journal each day. She uses a moveable alphabet to help with her sentence building, and then she transcribes her work into a notebook before drawing a picture to visually demonstrate what she’s written about. When she first started working on her journal writing at the beginning of grade 1, her entries were usually one simple line (i.e. ‘I love Shopkins’), but I’m amazed at how much her written language skills continue to develop each time she brings home a completed journal to share with me. Not only has her penmanship improved immensely, but she has develop a much deeper understanding of what constitutes a proper sentence, which has motivated me to take things a step further by researching sentence building activities we can do on the weekends together. Whether you’re looking for sentence building worksheets and activities for your students, or want some at-home ideas to keep your little ones occupied on weekends and school holidays, this collection of 39 ideas will inspire you! The subject is the noun or pronoun the sentence is about, and the predicate is what the subject is (or is doing). Sentence building is all about teaching the art of proper sentence structure to kids. When Do Kids Start to Learn About Sentence Building? Whether we realize it or not, our children start to learn about sentence building at a very young age. Each child is obviously different and will develop at his/her own pace, so try not to get too hung up on exact ages, but once you child starts to put words together, he/she is already learning about sentence structure! Our kids are like sponges – they soak up everything they experience through their senses – so be careful to use proper sentences when communicating with your child, and to (positively) correct their grammar as needed. Written sentence building obviously takes longer to develop. The Kindergarten curriculum focuses on teaching kids the alphabet, sight words, sound-letter associations, and basic printing, with basic sentence building beginning in grade one. Language lessons progress from there, and much of the literature I’ve read online suggests that children have a much stronger grasp about proper sentence building by the end of grade 3. One of my favorite resources to find learning material for kids is Teachers Pay Teachers, and while researching for this post, I also spent a lot of time on Education.com. Both sites offer a ton of free sentence building printables, and Teachers Pay Teachers also offers a variety of bundles you can purchase for a small fee to support your lesson plans. I only included a few options for each stage of sentence building below, but once you click over to the corresponding website, you’ll be able to find additional worksheets within that theme (sight words, sentence building, scrambled sentences, etc.). You can also create your own sentence building worksheets with the ideas provided for endless learning opportunities! 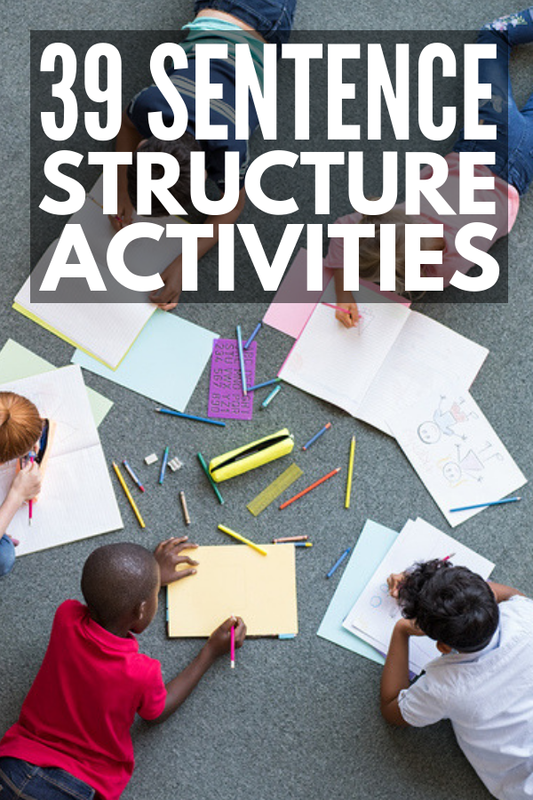 I hope this collection of sentence structure worksheets and activities, as well as the sentence building games we included above inspire you to find fun and engaging ways to get your students and/or children excited about language arts! If you liked this collection of sentence structure worksheets and activities and sentence building games, please share this post on Pinterest! And if you’re looking for more ways to have fun with the little ones in your life, please follow our Kids board where we share all kinds of great ideas we find each day!